Hey everyone! I am back from Spring Break in South Carolina. The weather was great and we were even able to fit in a fun craft thanks to my Aunt's brilliant idea. This would be a great craft to do with the kids on the beach. It's easy and fast and so much fun! Start with a shell of your choice and push it into the sand face down. Use an old frame to also push into the sand. Fill the hole with Plaster of Paris. Continue to fill it all in. Let it dry in the sun while you go swimming. An hour or so later, gently pull it out of the sand and rinse it in the water. And now you have a mold of your favorite shell to remember your favorite vacation. I would never think to bring plaster with me, but I may have to now! I have never seen such a thing - awesome!! Must share with our Facebook friends...they'll love it! How cool and cute is that? Thanks for sharing! Love it too!!! I'm always amazed by the creativity out there! We did this project with handprints one summer! The star fish is beautiful! I hope you stop by the Tuesday To Do party and share it! This is exactly what I need for garden art. Very simple. Can't wait to try it. Thanks for the instructions. I found you on Blue Cricket. What a great idea! I love seashells! Wow! That is such an awesome idea! Love it! LOVE this. We are headed to the beach in a couple days! My kids would be thrilled by this. Can you mix the plaster of paris with sea water? 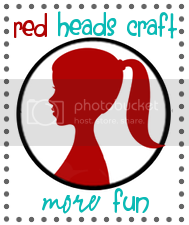 I am a red head too! Come by my blog. I'm your newest follower! Genius idea! I love this! We are at the beach all the time during the summer. I love that the kids could do something like this instead of lugging all those shells home. Thanks for the idea. I'm featuring this idea on my blog tomorrow. Thanks again for such a great idea! This is absolutely fabulous!! I'm going to make an entire WALL of shells!! LOVE IT!! Happy to be your newest follower! P.S. I'm also a redhead!! I love this creation! Thanks for sharing. Can't wait to try it! That is beautiful! So pretty and clever. This is amazing!!! Since I live near a beach in SC and was about to make the spare bedroom coastal- I'm in love with this idea! Thank you so much for sharing!!! What a great idea! Just love it! Thank you so much for sharing. Definitely going to try this. Newest follower. This is so clever! I can't wait to take a trip to the beach now, and I better remember plaster on my packing list! Love this! Will do it with my class next term for sure! Thanks. I'll right away grasp your rss feed as I can not find your e-mail subscription link or newsletter service. Do you've any? Valuable information. Fortunate me I found your site by chance, and I'm shocked why this accident didn't came about earlier! I comment each time I appreciate a article on a site or I have something to add to the conversation. Usually it's triggered by the passion communicated in the article I browsed. And on this post "Sea Shell Plaster Mold". I was actually moved enough to drop a comment :) I actually do have 2 questions for you if you usually do not mind. Could it be only me or do some of these comments look as if they are coming from brain dead folks? :-P And, if you are posting at other sites, I would like to keep up with everything fresh you have to post. Could you make a list all of all your community sites like your linkedin profile, Facebook page or twitter feed? I think the admin of this site is actually working hard for his website, as here every stuff is quality based data.